While I don’t consider myself a foodie, I do have my weak spots, and brownies are one of them. When I received this recipe (in an email – I kid you not!) I had all the ingredients on hand, and a friend’s luncheon to make them for. There were six of us, so one tray was the perfect amount (so we could all enjoy seconds, too). These brownies were an instant hit. Last week I made homemade chocolates for a birthday bash, and as yummy as my chocolates are, two of my friends requested I bring these brownies next time. 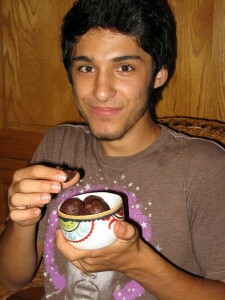 Put the walnuts, dates, cacao powder and salt into the food processor and pulse until a dough has formed. Roll the brownie dough in cacao nibs and press into an 8×8 glass or non-stick baking pan or roll into truffle-like balls. Top with the extra cacao nibs. 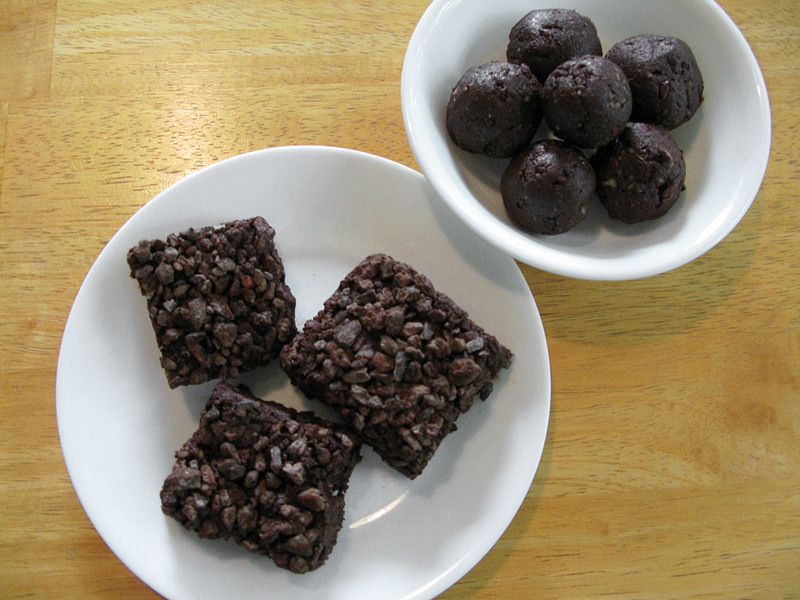 Variations: replace the sweetened cacoa nibs with chocolate chips, or raisins and grated coconut. Replace the walnuts with cashews or pecans. Tip: If your dates are not soft, soak them in purified water beforehand. Caution: I strongly recommend you make these to be shared with others. Having a tray of these brownies around with no one else to share them with could be dangerous. Trust me, even the most self controlled will be challenged.